Today’s word is not really a reflection of what is happening here and over at Melissa’s blog. http://grosvenorsquare.blogspot.ca/ We are having a carnival of writing spaces. Attrition – definition: a reduction or decrease in numbers, size, or strength over time. In actual fact the opposite is true. An increase in participants and sharing is happening. Come and join in the fun of this Blog Carnival. This is my writing area, it’s still a work in progress but a lot better than my previous make do space. I upgraded my writing space last June from the dining room table to a proper desk set up at one end of our living room. With the addition of bookshelves, printer, filing drawers and inspirational pictures on the wall. It is my favorite place in the house, with views left and right of our acreage and the wildlife that lives in it. In an ideal world I would have a separate room away from the constant noise of the TV but step by step, I hope to have my own study some day. This picture shows my old faithful silver laptop, which assisted me through three NaNoWriMo challenges as well as a ton of writing. 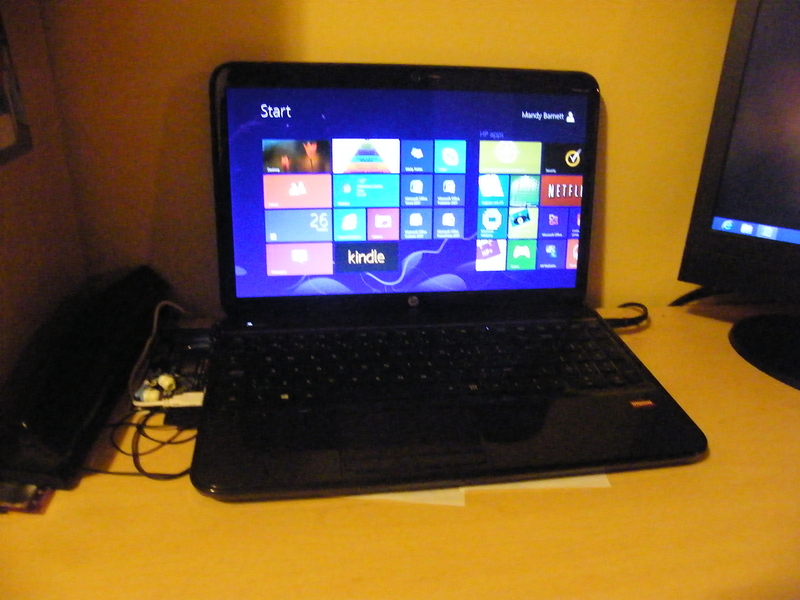 Unfortunately just before Christmas it died and I invested in a new one with Windows 8. It has taken some time to get used to the new format but now I am going full blast. The little green creature on top of the shelf is the soft toy version of my Rumble character I made. 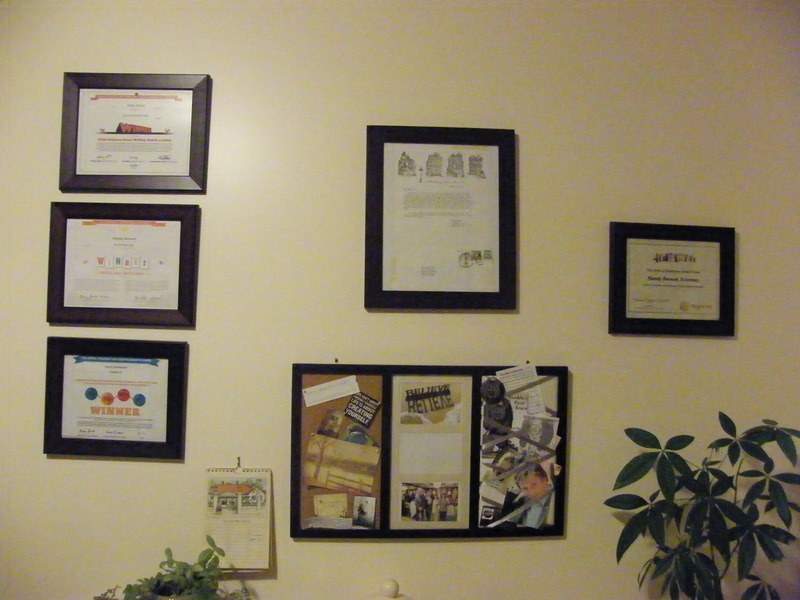 My inspirational wall, including NaNoWriMo certificates, a letter from Stephen King and the Pride of Strathcona Award, I received. You know Mandy, it doesn’t matter where we write so long as we write! 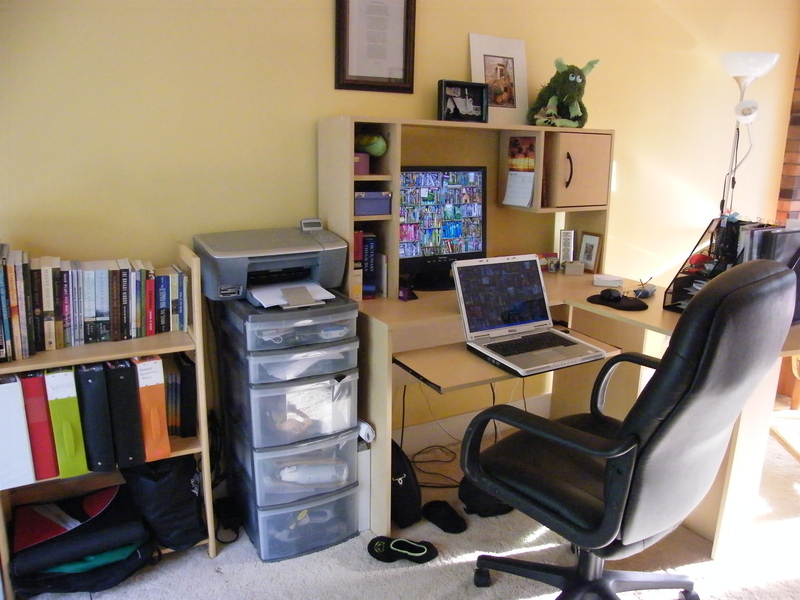 Someday that big ol’ desk will come, and then you’ll move and you’ll have to try and heft that heavy desk and your friend will drop it on your foot and it won’t fit in your next writing space and you’ll have to get it into the house through the balcony…okay, maybe that’s just me. I’m so glad you carved out a space of your own – even if it is in another room. I think it’s so important to have a place just for you! I love your green Rumble character. How cool is that? Thanks so much for participating in the Blog Carnival! Thank you Melissa – Rumble is a hit at sales events but I have to keep a close eye no one walks off with him. I make little hand puppets for kids too. This space is one end of the lounge/dining room so TV noise is a pain! I loved looking around the other writers spaces – such fun. I love your inspiration wall! Great idea! Thanks Valerie – I’m looking at rearranging again and purchasing a larger book case.